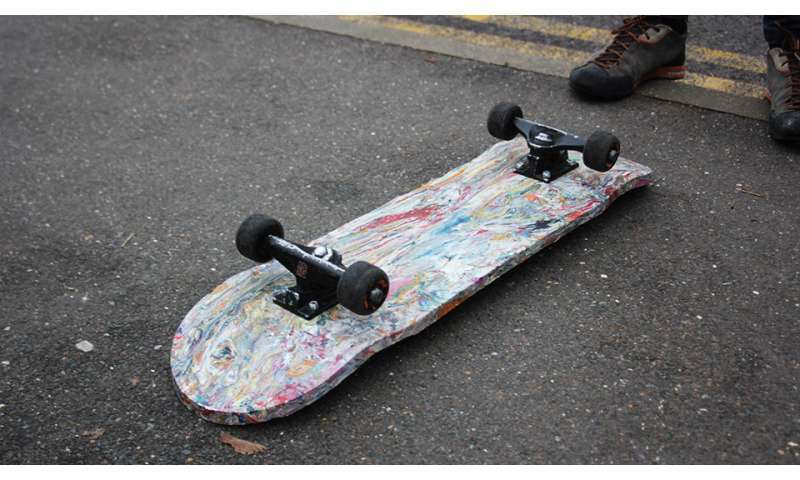 A compact press that turns plastic shopping bags into skateboards has been designed by a student at Brunel University London in a bid to tackle community litter and deforestation - and give kids a cheap new hobby. Over 300 million tons of plastic is produced globally each year, and while a large percentage of it can be recycled, much is simply trashed. Around 90% finds its way in to landfills, oceans, animal stomachs and our water supply. 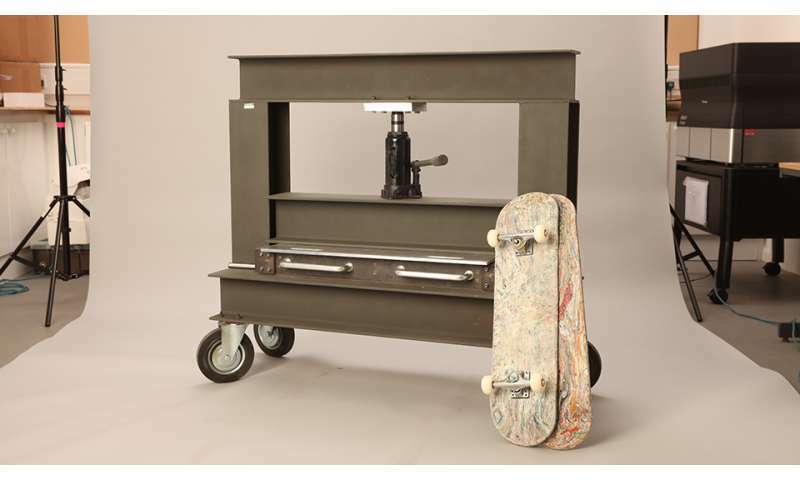 BA Industrial Design and Technology student Jason Knight, 22, believes that recycling could become a fun, more attractive, activity if the waste can be turned into something constructive for young people with a tangible personal reward as well as an environmental impact. Skateboard decks are traditionally made from plywood, most often taken from Canadian maple trees, and are one of the biggest causes of maple deforestation. Pro-skateboarders can go through dozens of decks a year, and young fans can find the cost of replacing their boards prohibitive. Jason hopes that independent skate shops and other local businesses could ultimately set up their own recycling centres, allowing people to use the machine with their own collected waste plastic. The waste plastic would gain a new purpose, and the personal cost of buying a new deck (typically around £40-£60) would be reduced. He began experimenting with recycling plastics two years ago, shredding and then melting down bags made from high-density polythene. Once heated to 130 degrees, the plastic becomes soft and malleable like clay and reduces in size as particles melt together. 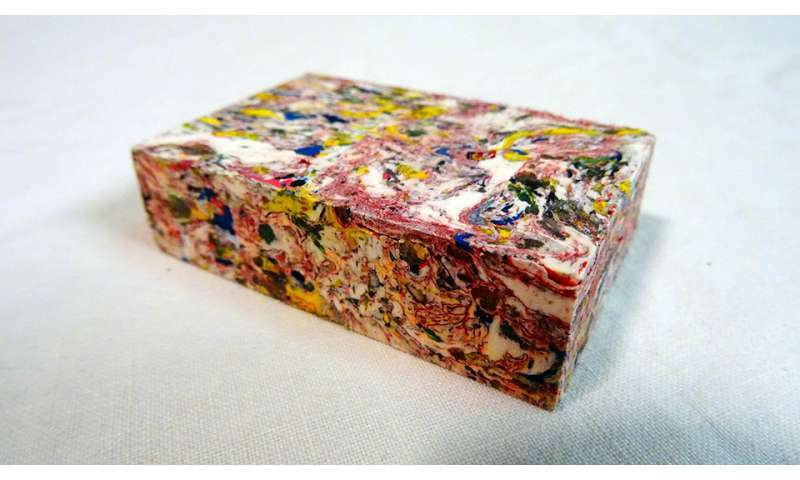 Sustained pressure moulds it into a solid object and, with air pockets removed, creates an incredibly strong material with a multi-coloured surface finish resembling marble. During a placement year as part of his course, Jason worked at Danis FabLab, FabLab RUC, developing a plastic shredding machine after realising the most time consuming part of the process was breaking down plastic bags by hand. He exhibited the shredder at a number of music and art festivals in 2016 and ran plastic recycling workshops, helping festival-goers melt and mould bags into hard plastic bottle openers. For his final year university project – set to be exhibited from 15-18 June as part of the annual Made in Brunel showcase – he designed an easy-to-use, compact, and relatively inexpensive press and a range of prototype boards. Experienced skateboarders have described the decks as more flexible than a wooden board but, when you get the hang of it, "you can ollie (jump) higher than with a wooden board, opening up new possibilities for tricks". Aesthetically, the boards "look incredible". "The fact that each board is unique is so cool, riders will be able to customise their decks with whatever colours they like," one user added. The final press is a self-contained heating and pressing machine, which includes safety lights to stop users burning themselves and a heating implement activated with a simple twist thermostat. Built from steel, the press weighs 200kg in total, stands around 6ft x 6ft, holds an aluminium mould, and is mounted on wheels. 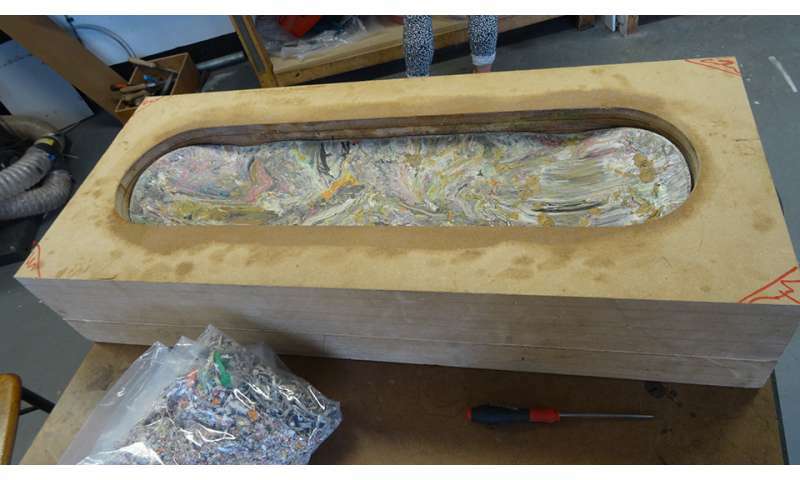 Before pressing a deck the inner faces of the mould are coated with a release agent, acting as a lubricant so the molten plastic spreads with as little effort as possible. It currently takes around two hours to heat the plastic required for one skateboard, but Jason plans to continue developing his design to speed things up. "It's been proven that there's a positive correlation between people interested in skateboarding and people interested in sustainability. Yet there's also this dated stigma going back to the origins of skateboarding subculture that considers skateboarders are a public nuisance," Jason explains. "I hope that this design, which could allow people to contribute to a local community by collecting waste while creating something really cool, might go some way in helping challenge that stigma." More information: Made in Brunel is a student led collaborative platform focused on showcasing good design from Brunel University London. The Made in Brunel exhibition runs from 15 – 18 June 2017 (11am-6pm) at the Bargehouse, Oxo Tower Wharf, London.